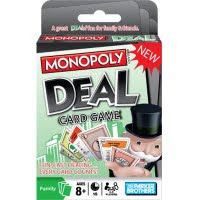 The Monopoly printable coupon is good on any Monopoly game. Make sure to call your Toys R Us in advance if you are not sure if they accept manufacturer coupons or not. Some of the stores will not accept them. Toys R Us is offering up a sweet deal of the day, TODAY, 3/15. All card games will be on a buy one get one FREE sale! Plus, if you were lucky enough to get the buy 2 get 1 FREE Hasbro card game coupon you can really turn this into a sweet deal! - Final cost ONLY $0.99 for all 6 games– just $0.17 per game! - Final cost ONLY $0.99 for 2 card games! **You can score a similar deal at Target. That's a great deal. I have to drive 20 miles or so to get to a Toys R Us, but if I can think of any other errands in that part of the city, I might try to make this deal work for me. Thanks. Thank you for thinking of me! I'm special in a window licker sort of way! I was thinking about running some errands. Hmmmmm, A.Marie told me to do it! Well, my Parade magazine didn't have the coupon. :( Maybe it was regional. Mine had a Prilosec coupon. Annie Jones....I was bummed also! My Parade mag didn't have any coupons in it! Not even a Prilosec one! BOO! !